Enrique has a history of firsts—In 1998 he was the first person to be granted dual citizenship with Mexico, the first president of the San Diego County Hispanic Chamber of Commerce, Vice President in Major League Sports with the San Diego Padres bringing the first ever regular season games outside the US/Canada, the President and Founder of House of Mexico and President and Founder of Border Angels (saving migrant lives), an all volunteer group. Enrique has been featured on NBC, CNN, CBS, BBC, NPR, Univision's Don Francisco Presenta, Televisa Nacional, Rocio en Telemundo and in countless other international media around the world. He frequently lectures and has more than held his own on shows with Bill O'Reilly and Lou Dobbs. Morones promotes the TRUTH about the migrant community. 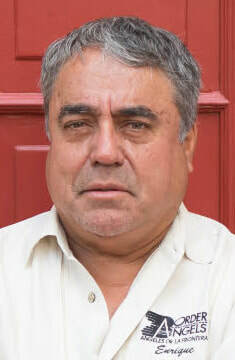 As a founder of GENTE UNIDA (a human rights border coalition) in May of 2005, he has led the national effort against the vigilante Minutemen soundly shutting them down in California. He is recognized as one of the 100 most influential Latinos in the USA by HISPANIC BUSINESS MAGAZINE and his recognitions include being FRONTLINE HUMAN RIGHTS international awardee for his lifelong dedication to Human Rights,2009 National Human Rights Award, presented by Mexican President Felipe Caldron, 2010 California Spirit Award, presented , Gil Cedillo, and the Bishop Buddy Alumni award presented by "USD" University San Diego.